AUSTIN BOMBING SUSPECT IS DEAD … GREAT JOB BY LAW ENFORCEMENT!!! BREAKING … The Austin bombing suspect is dead. The suspect,who has terrorized Austin, Texas over the past three weeks was identified as a 24 year old, white male. His name has not yet been released. The suspect blew himself up in his vehicle as law enforcement closed in. Interim Austin Police Chief Brian Manley stated that the investigation continues; however, the suspect was responsible for for all of the incidents in Austin. In a press conference Wednesday morning, the police chief said that the suspect detonated a bomb inside the vehicle he was riding in as police approached. One officer was injured when the bomb was detonated but he suffered minor injuries. 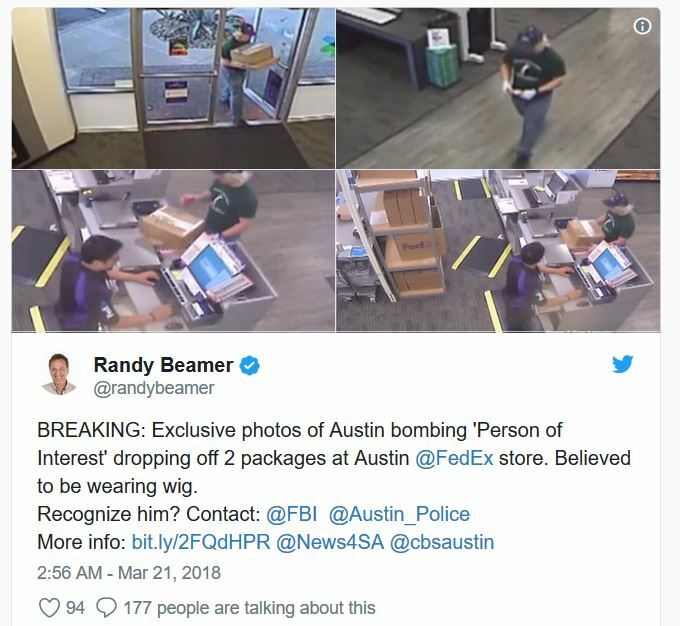 According to KVUE’s Tony Plohetski, authorities said they used surveillance video from the FedEx store on Brodie Lane in South Austin to lead them to the suspect. Chief Manley said they “don’t know where the suspect has been the past 24 hours,” and that there may be other devices out there. The public must remain vigilant and call 911 if they see anything suspicious. suspect, described only as a 24-year-old white man, has not been released, pending notification of his family, Manley said. Police have not identified a motive for the string of bombings, Manley said. Investigators identified several leads but the case really broke in the past 24 to 36 hours, the chief said. He described how authorities tracked down the suspect’s vehicle to a Round Rock-area hotel. Police began following the suspect’s vehicle, and as SWAT approached, the suspect detonated a bomb in the car, Manley said. Clues leading up to tracking down the Austin bomber. Exclusive photos of Austin bombing ‘Person of Interest’ dropping off 2 packages at Austin @FedEx store. Believed to be wearing wig. LIVE Coverage can be see HERE. Surveillance teams tracked the suspect’s vehicle to a hotel in Round Rock, north of Austin. As police waited on tactical units, the vehicle left the hotel. SWAT approached the vehicle and the suspect detonated a bomb, killing himself and knocking back and injuring a SWAT member. A SWAT officer fired his weapon at the suspect. It’s unclear whether the officer shot the suspect. The suspect is a 24-year-old white man, and authorities don’t know whether he acted alone or what his motive was. He urged residents to be vigilant, saying they don’t know where the bomber has been for the past 24 hours and if he sent additional packages. “Austin bombing suspect is dead. Great job by law enforcement and all concerned!,” President Donald Trump tweeted. Twenty-two people are dead following a terrorist suicide bombing that took place in Manchester, England following an Ariana Grande concert. Police said the explosion took place outside the arena catching people as they exited. ISIS has claimed responsibility for the cowardly act. The bomber also died when he detonated an improvised explosive device near one of the venue’s exits at 10:33 p.m. local time (5:33 p.m. ET) on Monday, according to authorities. Officials said 59 other people were injured. Many others remained missing. The incident sparked a nightlong search for loved ones as frantic parents tried to locate their children, and groups of friends scattered by the explosion sought each another. Video shot inside the 21,000-capacity venue showed teenagers screaming as they made their way out amid a sea of pink balloons. Some fans were still wearing the pop star’s trademark kitten ears as they fled. Air France fight 463 that was heading to Charles de Gaulle airport in Paris from Mauritius was diverted to the Kenyan city of Mombasa early Sunday morning. The pilots requested an emergency landing after a device suspected to be a bomb was found in a lavatory. Authorities are questioning several suspects who were on an Air France flight. The device was made of cardboard, paper and a household timer, and had been found in a little cupboard that is behind a mirror. It was later determined to be a fake. 473 passengers and crew has to be evacuated from the aircraft by slides. The CEO of Air France said hours after the plane had been grounded that the device discovered in the bathroom was a fake bomb. The Boeing 777 was heading to Charles de Gaulle airport in Paris from Mauritius when its pilots requested an emergency landing at early Sunday in the Kenyan city of Mombasa. Frederic Gagey, the head of the airline, said the device was made of cardboard, paper and a household timer, and had been found in a little cupboard that is behind a mirror. UPDATE I: Four arrested after bomb scare causes Air France flight to divert to Kenya. Four people have been arrested over a suspicious device that was found in the restroom of an Air France flight, prompting an emergency landing in Kenya early Sunday. The four had all been on board Air France Flight 463, a Boeing 777 bound from Mauritius to Paris, which was diverted to the coastal Kenyan city of Mombasa after the device was found, Kenyan Cabinet secretary for the Ministry of Interior Joseph Nkaissery told CNN. He did not disclose their nationalities.